"Christian IV" redirects here. For the Count Palatine of Zweibrücken, see Christian IV, Count Palatine of Zweibrücken. Christian IV (Danish: Christian den Fjerde; 12 April 1577 – 28 February 1648), sometimes colloquially referred to as Christian Den Fjerde in Denmark and Christian Kvart or Quart in Norway, was king of Denmark–Norway and Duke of Holstein and Schleswig from 1588 to 1648. His 59-year reign is the longest of Danish monarchs, and of Scandinavian monarchies. A member of the house of Oldenburg, Christian began his personal rule of Denmark in 1596 at the age of 19. He is frequently remembered as one of the most popular, ambitious, and proactive Danish kings, having initiated many reforms and projects. Christian IV obtained for his kingdom a level of stability and wealth that was virtually unmatched elsewhere in Europe. He engaged Denmark in numerous wars, most notably the Thirty Years' War (1618–48), which devastated much of Germany, undermined the Danish economy, and cost Denmark some of its conquered territories. He rebuilt and renamed the Norwegian capital Oslo as Christiania after himself, a name used until 1925. Christian was born at Frederiksborg Castle in Denmark on 12 April 1577 as the third child and eldest son of King Frederick II of Denmark–Norway and Sofie of Mecklenburg-Schwerin. He was descended, through his mother's side, from king John of Denmark, and was thus the first descendant of King John to assume the crown since the deposition of King Christian II. At the time, Denmark was still an elective monarchy, so in spite of being the eldest son Christian was not automatically heir to the throne. However, in 1580, at the age of 3, his father had him elected Prince-Elect and successor to the throne. At the death bed of Niels Kaas. The 17-year-old Christian IV receives from the dying chancellor the keys to the vault where the royal crown and sceptre are stored. History painting by Carl Bloch, 1880. At the death of his father on 4 April 1588, Christian was 11 years old. He succeeded to the throne, but as he was still under-age a regency council was set up to serve as the trustees of the royal power while Christian was still growing up. It was led by chancellor Niels Kaas and consisted of the Rigsraadet council members Peder Munk (1534-1623), Jørgen Ottesen Rosenkrantz (1523-1596) and Christopher Walkendorf. His mother Queen Dowager Sophie, 30 years old, had wished to play a role in the government, but was denied by the Council. 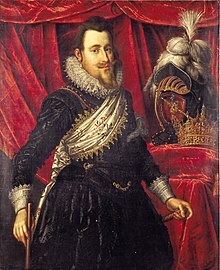 At the death of Niels Kaas in 1594, Jørgen Rosenkrantz took over leadership of the regency council. History painting by Otto Bache, 1887. Christian continued his studies at Sorø Academy where he had a reputation as a headstrong and talented student. In 1595, the Council of the Realm decided that Christian would soon be old enough to assume personal control of the reins of government. On 17 August 1596, at the age of 19, Christian signed his haandfæstning (lit. "Handbinding" viz. curtailment of the monarch's power, a Danish parallel to the Magna Carta), which was an identical copy of his father's from 1559. Twelve days later, on 29 August 1596, Christian IV was crowned at the Church of Our Lady in Copenhagen by the Bishop of Zealand, Peder Jensen Vinstrup (1549-1614). He was crowned with a new Danish Crown Regalia which had been made for him by Dirich Fyring (1580-1603), assisted by the Nuremberg goldsmith Corvinius Saur. On 30 November 1597, he married Anne Catherine of Brandenburg, a daughter of Joachim Friedrich, Margrave of Brandenburg and Duke of Prussia. Christian took an interest in many and varied matters, including a series of domestic reforms and improving Danish national armaments. New fortresses were constructed under the direction of Dutch engineers. The Danish navy, which in 1596 had consisted of but twenty-two vessels, in 1610 rose to sixty, some of them built after Christian's own designs. The formation of a national army proved more difficult. Christian had to depend mainly upon hired mercenary troops as was common practice in the times—well before the establishment of standing armies—augmented by native peasant levies recruited for the most part from the peasantry on the crown domains. Up until the early 1620s, Denmark's economy profited from general boom conditions in Europe. This inspired Christian to initiate a policy of expanding Denmark's overseas trade, as part of the mercantilist wave fashionable in Europe. He founded a number of merchant cities, and supported the building of factories. He also built a large number of buildings in Dutch Renaissance style. His sister Anne had married King James VI of Scotland, who succeeded to the English throne in 1603. To foster friendly relations between the two kingdoms, Christian paid a state visit to England in 1606. The visit was generally judged to be a success, although the heavy drinking indulged in by English and Danes alike caused some unfavourable comments: both Christian and James had an ability to consume great amounts of alcohol, while remaining lucid, which most of their courtiers did not share. The entertainment which was intended to crown the visit- a masque of Solomon and the Queen of Sheba- was described by the audience as a drunken fiasco, where most of the players simply fell over from the effects of too much wine. Despite Christian's many efforts, the new economic projects did not return a profit. He looked abroad for new income. Christian IV's Expeditions to Greenland involved a series of voyages in the years 1605-1607 to Greenland and to Arctic waterways in order to locate the lost Eastern Norse Settlement and to assert Danish sovereignty over Greenland. The expeditions were unsuccessful, partly due to leaders lacking experience with the difficult Arctic ice and weather conditions. The pilot on all three trips was English explorer James Hall. An expedition to North America was commissioned in 1619. The expedition was captained by Dano-Norwegian navigator and explorer, Jens Munk. The ships, searching for the Northwest Passage, arrived in Hudson Bay landing at the mouth of Churchill River, settling at what is now Churchill, Manitoba. However, it was a disastrous voyage, with cold, famine, and scurvy killing most of the crew. Tranquebar on India's south coast. In 1618, Christian appointed Admiral Ove Gjedde to lead an expedition establish a Danish colony in Ceylon. The expedition set sail in 1618, taking two years to reach Ceylon and losing more than half their crew on the way. Upon arriving in May 1620, the establishment of a colony in Ceylon failed, but instead the Nayak of Tanjore (now Thanjavur in Tamil Nadu) turned out to be interested in trading opportunities and a treaty was negotiated granting the Danes the village of Tranquebar (or Tarangamabadi) on India's south coast and the right to construct a "stone house" (Fort Dansborg) and levy taxes. The treaty was signed on 20 November 1620, establishing Denmark's first colony in India. Christian also assigned the privilege establishing the Danish East India Company. In 1611, he first put his newly organised army to use. Despite the reluctance of Rigsraadet, Christian initiated a war with Sweden for the supremacy of the Baltic Sea. It was later known as the Kalmar War because its chief operation was the Danish capture of Kalmar, the southernmost fortress of Sweden. Christian compelled King Gustavus Adolphus of Sweden to give way on all essential points at the resulting Treaty of Knäred of 20 January 1613. However, despite Denmark's greater strength, the gains of the war were not decisive. He now turned his attention to the Thirty Years' War in Germany. Here, his objectives were twofold: first, to obtain control of the great German rivers— the Elbe and the Weser— as a means of securing his dominion of the northern seas; and secondly, to acquire the secularised German Archdiocese of Bremen and Prince-Bishopric of Verden as appanages for his younger sons. He skillfully took advantage of the alarm of the German Protestants after the Battle of White Mountain in 1620, to secure co-adjutorship of the See of Bremen for his son Frederick (September 1621). A similar arrangement was reached in November at Verden. Hamburg was also induced to acknowledge the Danish overlordship of Holstein by the compact of Steinburg in July 1621. Christian IV receives homage from the countries of Europe as mediator in the Thirty Years' War. Grisaille by Adrian van de Venne, 1643. Christian IV had obtained for his kingdom a level of stability and wealth that was virtually unmatched elsewhere in Europe. Denmark was funded by tolls on the Øresund and also by extensive war-reparations from Sweden. Denmark's intervention in the Thirty Years' War was aided by France and by Charles I of England, who agreed to help subsidise the war partly because Christian was of uncle of both the Stuart king and his sister Elizabeth of Bohemia through their mother, Anna of Denmark. Some 13,700 Scottish soldiers were to be sent as allies to help Christian IV under the command of General Robert Maxwell, 1st Earl of Nithsdale. Moreover, some 6000 English troops under Charles Morgan also eventually arrived to bolster the defence of Denmark though it took longer for these to arrive than Christian hoped, not least due to the ongoing British campaigns against France and Spain. Thus Christian, as war-leader of the Lower Saxon Circle, entered the war with an army of only 20,000 mercenaries, some of his allies from Britain and a national army 15,000 strong, leading them as Duke of Holstein rather than as King of Denmark. Despite the growing power of Roman Catholics in North Germany, and the threat to the Danish holdings in the Schleswig-Holstein duchies, Christian for a time stayed his hand. The urgent solicitations of other powers, and his fear that Gustavus Adolphus should supplant him as the champion of the Protestant cause, finally led him to enter the war on 9 May 1625. He also feared that Sweden could use a war to further expand their holdings in the Baltic Sea. Christian embarked on a military campaign which was later known in Denmark and Norway as "The Emperor War" (Danish: Kejserkrigen, Norwegian: Keiserkrigen). He had at his disposal from 19,000 to 25,000 men, and at first gained some successes; but on 27 August 1626 he was routed by Johan Tzerclaes, Count of Tilly in the Battle of Lutter. Christian had not thoroughly planned the advance against the combined forces of the Holy Roman Emperor and the Catholic League, as promises of military support from the Netherlands and England did not materialise. In the summer of 1627 both Tilly and Albrecht von Wallenstein occupied the duchies and the whole peninsula of Jutland. Christian now formed an alliance with Sweden on 1 January 1628, as he and Gustavus Adolphus shared the reluctance of German expansion in the Baltic region. Gustavus Adolphus pledged to assist Denmark with a fleet in case of need, and shortly afterwards a Swedo-Danish army and fleet compelled Wallenstein to raise the siege of Stralsund. Thus with the help of Sweden, the superior sea-power enabled Denmark to tide over her worst difficulties, and in May 1629 Christian was able to conclude peace with the emperor in the Treaty of Lübeck, without any diminution of territory. However, the treaty bound Christian not to interfere in the Thirty Years' War any further, removing any Danish obstacles when Gustavus Adolphus entered the war in 1630. Christian's foreign policy did not suffer from lack of confidence following the Danish defeat in The Thirty Years' War. To compensate for lacking export revenues, and also in order to stifle the Swedish advances in the Thirty Years' War, Christian enacted a number of increases in the Sound Dues throughout the 1630s. Christian gained both in popularity and influence at home, and he hoped to increase his external power still further with the assistance of his sons-in-law, Corfitz Ulfeldt and Hannibal Sehested, who now came prominently forward. Between 1629 and 1643 the European situation presented infinite possibilities to politicians with a taste for adventure. However, Christian was incapable of a consistent diplomatic policy. He would neither conciliate Sweden, henceforth his most dangerous enemy, nor guard himself against her by a definite system of counter-alliances. Christian contacted the Roman Catholic part of the Thirty Years' War, and offered to broker a deal with Sweden. However, his mediating was highly skewed in favour of the Holy Roman Emperor, and was a transparent attempt of minimising the influence Swedish influence in the Baltics. His Scandinavian policy was so irritating and vexatious that Swedish statesmen advocated for a war with Denmark, to keep Christian from interfering in the peace negotiations with the Holy Roman Emperor, and in May 1643, Christian faced another war against Sweden. The increased Sound Dues had alienated the Dutch, who turned to support Sweden. Christian at the Battle of Colberger Heide. Sweden was able, thanks to their conquests in the Thirty Years' War, to attack Denmark from the south as well as the east; the Dutch alliance promised to secure them at sea. In May, the Swedish Privy Council decided upon war; on 12 December the Swedish Field Marshal Lennart Torstensson, advancing from Bohemia, crossed the southern frontier of Denmark; by the end of January 1644 the whole peninsula of Jutland was in Swedish hands. This unexpected attack, conducted from first to last with consummate ability and lightning-like rapidity, had a paralysing effect upon Denmark. In his sixty-sixth year he once more displayed something of the energy of his triumphant youth. Night and day he laboured to levy armies and equip fleets. Fortunately for him, the Swedish government delayed hostilities in Scania until February 1644, and the Danes were able to make adequate defensive preparations and save the important fortress of Malmö. The Danish fleet denied Torstensson crossing from Jutland to Funen, and defeated the Dutch auxiliary fleet which came to Torstensson's assistance at the Action of 16 May 1644. Another attempt to transport Torstensson and his army to the Danish islands by a large Swedish fleet was frustrated by Christian IV in person on 1 July 1644. On that day the two fleets encountered at the Battle of Colberger Heide. As Christian stood on the quarter-deck of the Trinity a cannon close by was exploded by a Swedish cannonball, and splinters of wood and metal wounded the king in thirteen places, blinding one eye and flinging him to the deck. But he was instantly on his feet again, cried with a loud voice that it was well with him, and set every one an example of duty by remaining on deck till the fight was over. Darkness at last separated the contending fleets; and the battle was drawn. The Danish fleet subsequently blockaded the Swedish ships in the Bay of Kiel. But the Swedish fleet escaped, and the annihilation of the Danish fleet by the combined navies of Sweden and the Netherlands, after an obstinate fight between Fehmarn and Lolland at the end of September, exhausted the military resources of Denmark and compelled Christian to accept the mediation of France and the Netherlands; and peace was finally signed with the Treaty of Brömsebro on 8 February 1645. Here Denmark had to cede Gotland, Ösel and (for thirty years) Halland, while Norway lost the two provinces Jämtland and Härjedalen, giving Sweden the supremacy of the Baltic Sea. Christian IV spent more time in Norway than any other Oldenberg monarch and no Oldenburg king made such a lasting impression on the Norwegian people. He visited the country a number of times and founded four cities. He also established and took control over one silver mine (Kongsberg), one copper mine (Røros), and tried to make an iron plant with limited success in Eiker. He also restored the fortress at Akershus, where he invited the people of Norway to the official and age-old installment of the king in 1590, and again in 1610. When the king was busy overseeing the reparations and re-building of the fortress at Oslo, he lived in the country all summer, and at the same time tried to establish a centre for producing iron at Eiker, Buskerud. History tells he actually ruled the entire kingdom from this area in the summer of 1603. In 1623, Christian again visited Norway for an entire summer, this time to oversee the foundation of Kongsberg. He was also present in the area in 1624, when Oslo burned in August of that year. The king was able to reach the area in a few weeks, being in Eiker. Over the years, fire had destroyed major parts of the city many times, as many of the city's buildings were built entirely of wood. After the fire in 1624 which lasted for three days, Christian IV decided that the old city should not be rebuilt again. He decided that the new town be rebuilt in the area below Akershus Fortress, a castle which later was converted into a palace and royal residence. His men built a network of roads in Akershagen and demanded that all citizens should move their shops and workplaces to the newly built city of Christiania. During the fourteenth century the Swedish kings tried to push the areas of their control towards the north, and contemporary maps depicted the now Norwegian coastal areas of Troms and Finnmark as a part of Sweden. The possibly boldest move of any Danish-Norwegian regent was to make a voyage to the Northern Lands to secure these lands under the Danish-Norwegian crown. After the Torstenson War, Rigsraadet took on an increasing role, under the leadership of Corfitz Ulfeldt and Hannibal Sehested. The last years of Christian's life were embittered by sordid differences with his sons-in-law, especially with Corfitz Ulfeldt. His personal obsession with witchcraft led to the public execution of some of his subjects during the Burning Times. He was responsible for several witch burnings, most notably the conviction and execution of Maren Spliid (Splids), who was victim of a witch hunt at Ribe and was burned at the Gallows Hill near Ribe on 9 November 1641. On 21 February 1648, at his earnest request, he was carried in a litter from Frederiksborg to his beloved Copenhagen, where he died a week later. He was buried in Roskilde Cathedral. The chapel of Christian IV had been completed 6 years before the King died. Christian was reckoned a typical renaissance king, and excelled in hiring in musicians and artists from all over Europe. Many English musicians were employed by him at several times, among them William Brade, John Bull and John Dowland. Dowland accompanied the king on his tours, and as he was employed in 1603, rumour has it he was in Norway as well. Christian was an agile dancer, and his court was reckoned the second most "musical" court in Europe, only ranking behind that of Elizabeth I of England. Christian maintained good contact with his sister Anne, who was married to James VI of Scotland. His other sister, Elizabeth, was married to the Duke of Brunswick-Lüneburg, and artists and musicians travelled freely between the courts. Christianopel, now Kristianopel in Sweden. Founded in 1599 in the then Danish territory of Blekinge as a garrison town near the Swedish border. Christianstad, now Kristianstad in Sweden. Founded in 1614 in the then Danish territory of Skåne. Glückstadt, now in Germany, founded in 1617 as a rival to Hamburg in the then Danish territory of Holstein. Christianshavn, now part of Copenhagen, Denmark, founded as a fortification/garrison town in 1619. Konningsberg (King's Mountain), now Kongsberg in Norway, founded as an industrial town in 1624 after the discovery of silver ores. Christiania, now Oslo in Norway. After a devastating fire in 1624 the king ordered the old city of Oslo to be moved closer to the fortification of Akershus slot and also renamed it Christiania. The city name was altered to Kristiania in 1877 and then back to Oslo in 1924. The original town of Christian is now known as Kvadraturen = The Quarters. Christian(s)sand, now Kristiansand in Norway, founded in 1641 to promote trade at the Agdesiden len [no] in Southern Norway. Røros, now in Norway, founded as an industrial town after the discovery of copper ores. Christianspris, now in Schleswig, Germany, founded as a garrison town near Kiel in the then Danish territory of Holstein. Christian IV monument in Stortorvet, Oslo by Carl Ludvig Jacobsen. The statue was completed in 1878 and unveiled on 28 September 1880. When Christian was crowned king, Denmark-Norway held a supremacy over the Baltic Sea, which was lost to Sweden during the years of his reign. Nevertheless, Christian was one of the few kings from the House of Oldenburg that achieved a lasting legacy of popularity with both the Danish and Norwegian people. As such, he featured in the Danish national play Elverhøj. Furthermore, his great building activities also furthered his popularity. Christian IV spoke Danish, German, Latin, French and Italian. Naturally cheerful and hospitable, he delighted in lively society; but he was also passionate, irritable and sensual. He had courage, a vivid sense of duty, an indefatigable love of work, and all the inquisitive zeal and inventive energy of a born reformer. His own pleasure, whether it took the form of love or ambition, was always his first consideration. His capacity for drink was proverbial: when he visited England in 1606, even the notoriously hard-drinking English Court were astonished by his alcohol consumption. In the heyday of his youth his high spirits and passion for adventure enabled him to surmount every obstacle with elan. But in the decline of life he reaped the bitter fruits of his lack of self-control, and sank into the grave a weary and brokenhearted old man. The Christian IV Glacier in Greenland is named after him. Christian IV is depicted as a brilliant but hard-drinking monarch in the Eric Flint and David Weber alternate-history novel 1634: The Baltic War. Christian IV is featured several times in the book series The Legend of the Ice People. Christian IV also features prominently in the novel Music and Silence by Rose Tremain, which is primarily set in and around the Danish court in the years 1629 and 1630. Christian IV is depicted as a foul-natured person, but a good king who did a lot to make his realm flourish, by the Danish alternative music band Mew in their song, "King Christian". Jeg, Christian (2017) is a biographical movie about the last days of Christian IV's life. His first queen was Anne Catherine. They were married 1597-1612. She died after bearing Christian seven children. In 1616 four years after her death the king privately married Kirsten Munk, by whom he had twelve children. In the course of 1628 he discovered that his wife, Kirsten Munk, was having a relationship with one of his German officers. Christian had Munk placed under house arrest. She endeavoured to cover up her own disgrace by conniving at an intrigue between Vibeke Kruse, one of her discharged maids, and the king. In January 1630 the rupture became final, and Kirsten retired to her estates in Jutland. Meanwhile, Christian openly acknowledged Vibeke as his mistress, and she bore him several more children. Frederik (15 August 1599 – 9 September 1599). Christian (10 April 1603 – 2 June 1647). Sophie (4 January 1605 – 7 September 1605). Elisabeth (16 March 1606 – 24 October 1608). Frederick III (18 March 1609 – 9 February 1670). Ulrik (2 February 1611 – 12 August 1633); murdered, as Ulrich III Administrator of the Prince-Bishopric of Schwerin (1624–1633). Kirsten Munk and children portrayed by Jacob van Doordt, 1623. Stillborn child (b. & d. 1615). Unnamed infant (b. & d. 1617). Countess Anna Cathrine of Schleswig-Holstein (10 August 1618 – 20 August 1633). Countess Sophie Elisabeth of Schleswig-Holstein (20 September 1619 – 29 April 1657). Countess Leonora Christina of Schleswig-Holstein (8 July 1621 – 16 March 1698); married Corfitz Ulfeldt. Count Valdemar Christian of Schleswig-Holstein (26 June 1622 – 26 February 1656). Countess Elisabeth Auguste of Schleswig-Holstein (28 December 1623 – 9 August 1677). Count Friedrich Christian of Schleswig-Holstein (26 April 1625 – 17 July 1627). Countess Hedwig of Schleswig-Holstein (15 July 1626 – 5 October 1678). Countess Maria Katharina of Schleswig-Holstein (29 May 1628 – 1 September 1628). Countess Dorothea Elisabeth of Schleswig-Holstein (1 September 1629 – 18 March 1687). Elisabeth Sophia Gyldenløve (1633–1654); married Major-General Klaus Ahlefeld. In the 1621 Treaty of The Hague and Treaty of Bremen between Denmark and the Dutch Republic, Christian was styled "Lord Christian the Fourth, King of all Denmark and Norway, the Goths and the Wends, duke of Schleswig, Holstein, Stormarn, and Ditmarsh, count of Oldenburg and Delmenhorst, etc." ^ Paul D. Lockhart, Denmark, 1513-1660: the rise and decline of a Renaissance monarchy (2007). This article incorporates text from a publication now in the public domain: Bain, Robert Nisbet (1911). "Christian IV." . In Chisholm, Hugh. Encyclopædia Britannica (11th ed.). Cambridge University Press. ^ "Rosenkrantz, Jørgen, 1523-96". Dansk biografisk Lexikon. Retrieved August 15, 2016. ^ "Dirich Fyring". kongernessamling.dk. Retrieved September 1, 2016. ^ "Vinstrup, Peder Jensen, 1549-1614, Biskop". Dansk biografisk Lexikon. Retrieved August 15, 2016. ^ "Anna Cathrine, 1575-1612, Dronning". Dansk biografisk Lexikon. Retrieved August 15, 2016. ^ "''Jens Munk - Scandinavia's First Great Polar Explorer'' (The Council of Europe Cultural Routes)". Ub.uit.no. Retrieved 2014-06-28. ^ Larsen, Kay (1907). Volume 1 of Dansk-Ostindiske Koloniers historie: Trankebar. Jørgensen. pp. 167–169. ^ Bredsdorff, Asta (2009). The Trials and Travels of Willem Leyel: An Account of the Danish East India Company in Tranquebar, 1639-48. Museum Tusculanum Press. p. 13. ISBN 9788763530231. ^ Gronseth, Kristian (2007). "A Little Piece of Denmark in India" (PDF). Department of Social Anthropology, University of Oslo. Retrieved 2013-07-07. ^ Paul D. Lockhart, Denmark, 1513-1660: the rise and decline of a Renaissance monarchy (Oxford University Press, 2007). ^ Lockhart, Paul Douglas (2007). Denmark, 1513-1660: the rise and decline of a Renaissance monarchy. Oxford University Press. p. 166. ISBN 0-19-927121-6. Retrieved 2009-08-07. ^ "History of Oslo". visitoslo. Retrieved August 15, 2016. ^ "Maren Spliid - The Witch". danhostel-ribe.dk. Retrieved August 15, 2016. ^ "Roskilde Cathedral - Royal Burial Plot". copenhagenet.dk. Retrieved August 15, 2016. ^ "Asiatisk Kompagni". Dansk biografisk Lexikon. Retrieved August 15, 2016. ^ "Jeg, Christian". goodcompanyfilms.com. Retrieved 13 February 2017. ^ Son Oldenburg 1598-1598 in Gen.cookancestry.com [retrieved 16 June 2014]. ^ "Treaty of the Hague". (in Dutch) In Davenport, Frances G. European Treaties Bearing on the History of the United States and Its Dependencies. The Lawbook Exchange, Ltd., 2004. ^ "Treaty of Bremen". (in Dutch) In Davenport, Frances G. European Treaties Bearing on the History of the United States and Its Dependencies. The Lawbook Exchange, Ltd., 2004. Lockhart, Paul D. Denmark, 1513-1660: the rise and decline of a Renaissance monarchy ( Oxford University Press, 2007). Wikimedia Commons has media related to Christian IV of Denmark. "Christian, the name of nine kings of Denmark. II. Christian IV." . The American Cyclopædia. 1879.